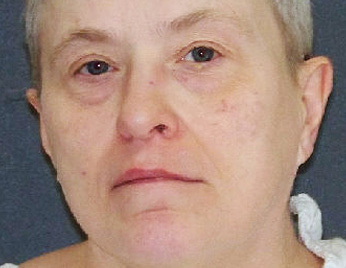 HUNTSVILLE, Texas - A woman convicted of torturing and killing a mentally impaired man she lured to Texas with the promise of marriage was put to death Wednesday evening in a rare execution of a female prisoner. The lethal injection of Suzanne Basso, 59, made the New York native only the 14th woman executed in the U.S. since the Supreme Court in 1976 allowed capital punishment to resume. Almost 1,400 men have been put to death during that time. Before being put to death, Basso told a warden, "No sir," when asked to make a final statement. She appeared to be holding back tears, then smiled at two friends watching through a nearby window. She mouthed a brief word to them and nodded. As the drug took effect, she began to snore. Her deep snoring became less audible and eventually stopped. Basso was pronounced dead at 6:26 p.m. CST, 11 minutes after the lethal dose of pentobarbital began. She was sentenced to die for the 1998 slaying of 59-year-old Louis "Buddy" Musso, whose battered and lacerated body, washed with bleach and scoured with a wire brush, was found in a ditch outside Houston. Prosecutors said Basso had made herself the beneficiary of Musso's insurance policies and took over his Social Security benefits after luring him from New Jersey. The execution, the second this year in Texas, came about an hour after the Supreme Court rejected a last-day appeal from Basso's attorney who argued she was not mentally competent. Lower federal courts and state courts also refused to halt the punishment, upholding the findings of a state judge last month that Basso had a history of fabricating stories about herself, seeking attention and manipulating psychological tests. Leading up to her trial, Basso's court appearances were marked by claims of blindness and paralysis, and speech mimicking a little girl. "It was challenging, but I saw her for who she was," said Colleen Barnett, the former Harris County assistant district attorney who prosecuted Basso. "I was determined I was not going to let her get away with it." Basso's attorney, Winston Cochran Jr., argued she suffered from delusions and that the state law governing competency was unconstitutionally flawed. Her lawyer said a degenerative disease left her paralyzed, but Basso, who used a wheelchair, blamed her paralysis on a jail beating years ago. At a competency hearing two months ago, she testified from a hospital bed wheeled into a Houston courtroom and talked about a snake smuggled into a prison hospital in an attempt to kill her. But she acknowledged lying about her background, including that she was a triplet, worked in the New York governor's office and had a relationship with Nelson Rockefeller. She originally was from the Albany and Schenectady areas of New York. Prosecutors said Musso was living in New Jersey when he met either Basso or her son at a church carnival, then moved to Jacinto City, east of Houston, with an offer of marriage. Evidence showed Basso was already married but took over Musso's benefits and insurance. An autopsy showed Musso had several broken bones, including a skull fracture and 14 broken ribs. His back was covered with cigarette burns, and bruises were found all over his body. Basso became a suspect after reporting Musso missing following the discovery of his body. Five others also were convicted, including Basso's son, but prosecutors only sought the death penalty for Basso. "Suzanne ran the show for sure. ... She was the one in charge. She directed them. She wanted the money," Barnett said. "She's a heinous killer." Among witnesses testifying at Basso's punishment trial was her daughter, who told of emotional, physical and sexual abuse at the hands of her mother. About 60 women are on death row in the U.S., making up about 2 percent of the 3,100 condemned inmates. Texas, the nation's busiest death-penalty state, now has executed five women and 505 men. The last woman executed in Texas before Basso was Kimberly McCarthy, who was put to death last June for killing her neighbor near Dallas and cutting off the 71-year-old victim's finger to steal her wedding ring.